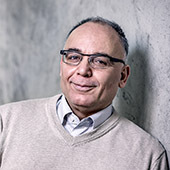 Bijan is research group leader at the Division of Building Technology, research group Infrastructure Physics, at Chalmers. He initiated a new field, Infrastructure Physics, at the division. His research area deals with heat and moisture transfer in buildings and infrastructures. Furthermore, he has long experience related to characterization of thermal properties of materials and components. Bijan is scientific coordinator of projects connectedto ferry free costal highway, E39. There might be more projects where Bijan Adl-Zarrabi participates, but you have to be logged in as a Chalmers employee to see them.